Abstract: This React tutorials shows how to read the change event of all inputs using a single method and handle event of child component in the parent component. Abstract: In this tutorial, I will look to explain one of the simpler patterns - the Facade Design Pattern, how to implement it, and why it's still relevant in modern development in ASP.NET Core. Abstract: Learn to write tests using the awesome vue-test-utils together with mocha-webpack. Also see how the vue-cli facilitates writing unit tests from the very beginning. Abstract: End-to-end (E2E) tests are the ones that present the biggest challenge. Not only are they closely dependent on the UI (which makes them very brittle), they also involve the largest number of moving parts. In this article, we will now take a look at E2E (end to end) testing of an ASP.NET Core application. Abstract: MongoDB GridFS is a good specification for storing large files in MongoDB. It makes sure that the file is divided into chunks and stored into a database. This article explains the mechanism of storing and retrieving binary files to and from MongoDB. Abstract: A deeper look at Integration Tests in the context of ASP.NET Core applications, dealing with factors like the Database, Authentication or Anti-Forgery. Abstract: Unit Tests are a powerful tool available to any developer. In this series of articles, we we will see how to add unit tests to a simple example ASP.NET Core project. We will go through an automated testing strategy involving unit tests, integration tests, end–to-end tests and load tests. Abstract: This article demonstrates how an ASP.NET Core application with EF Core can be easily developed with an open source database like PostgreSQL on Azure. Abstract: ASP.NET Core 2.0 was released in August 2017. This article looks at the most important new features of ASP.NET Core 2.0 and improvements over its previous versions. Abstract: Create PDF in ASP.NET MVC using the Rotativa package to convert a HTML response directly into a PDF document and print the PDF document. Abstract: Integrate Knockout.js and ASP.NET Core to build a Single Page Application (SPA). Also learn to define components for Razor based Views and enhance Razor pages with client side bindings. Abstract: This article explores the official Microsoft template for ASP.NET Core that uses Vue as its client-side framework and gets you started on using modern tooling and libraries like Webpack, Babel or hot-reload. Abstract: Build a complete ASP.NET MVC Core web application from the DB layer to the UI using the Mvc Controls toolkit core free library. We will also show data from a database in a paged Grid with filtering/sorting/grouping and add/edit/delete capabilities. Abstract: Get a nice debugging experience of your Single Page applications (SPA) in Visual Studio Code for both client and backend code. Abstract: In this article, we will explore the Redux pattern, why Redux and how it can help tackle SPA complexities. Abstract: The Ionic framework is one of the most popular hybrid mobile application frameworks. This tutorial focuses on building a simple hybrid app using Ionic 2, Angular 2 and TypeScript. Abstract: Use the Elastic Search API in an ASP.NET Core and Docker project and combining it with applications like Kibana for data analysis, reporting and visualization. Abstract: ASP.Net Core contains an Antiforgery package that can be used to secure your application against CSRF. This article will demonstrate how to use Antiforgery in your ASP.NET Core applications. Abstract: This article explores Docker, and how ASP.NET Core applications can be run inside Docker containers by building your own version of dotNetFiddle. Abstract: ASP.NET MVC 6 provides an easy approach for implementing Authentication using Microsoft.AspNet.Identity which we will be exploring in this article. Abstract: Microsoft announced ASP.NET Core 1.1 in November 26th 2016. This article explores the interesting new features, as well as improvements and fixes that was made to an already exciting framework. Abstract: Connected Services provide a proxy of Azure Storage services to access Azure Storage in an ASP.NET Core application to perform CRUD operations. Abstract: This article demonstrates how to keep ASP.NET front-end code clean, maintainable and reusable. This article builds a simple blogging site as an example. Abstract: Dependency Injection in ASP.NET MVC 6 a.k.a ASP.NET Core MVC Views helps developers to access view specific service logic directly used in View, without adding explicit logic in the controller. Abstract: ASP.Net Core has a new request pipeline. We will build a Vanity URL application to demonstrate this request pipeline, as well as other new features of ASP.NET Core. Abstract: This article talks about new features in jQuery 3 such as deferred, improved custom selectors, accelerated graphics, for..of, unwrap functionality, and security improvements. Abstract: Node.js based applications can be made more secured using Token Based Authentication. We will see how to use the Json Web Token package for this purpose. Abstract: Using crypto module in Node.js to implement digest authentication in our application. 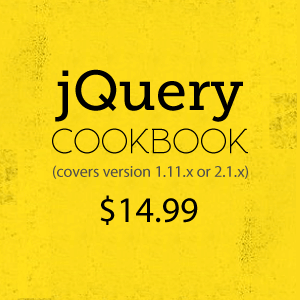 Abstract: Some jQuery code snippets that will be useful while working with HTML Tables. Abstract: Using the Custom Action method selector in ASP.NET MVC to invoke specific action method based on business need. Abstract: To Select or Deselect Checkboxes using jQuery, all you need to do is use the prop() method along with the change event to achieve the requirement in a couple of lines of code. Abstract: Read HTML file in Node.js using simple File IO operations and send a HTML response back to client. Abstract: Tag Helpers in ASP.NET Core 1.0/MVC 6 helps you to write server-side logic to generate Html contents and use it on Razor Views. This makes the View cleaner and easier to maintain. Abstract: ASP.NET MVC Exception Handling and Logging in Database using Exception Action Filters. Abstract: Using Angular.js to implement Internationalization in ASP.NET MVC applications. Abstract: Pass multiple objects to the Controller actions which accepts multiple model objects as input parameters. Abstract: In Node.js using http module’s request object we can call an external service. Abstract: Using Diagnostics in ASP.NET MVC 6 (Core 1.0), we will see how to easily sort out coding issue in a sample application. Abstract: ASP.NET MVC 6 has inbuilt support for Dependency Injection, which can be used for implementing decoupling across different layers of our ASP.NET MVC application. Abstract: InMemory Cache in ASP.NET MVC 6 and ASP.NET Core is one of the reliable ways to prevent an additional roundtrip to the data source for data that does not change frequently. This article provides an overview.